Is this the America you want? If not, here's how to claim the power to change your country. We are in an age of epic political turbulence in America. Old hierarchies and institutions are collapsing. From the election of Donald Trump to the upending of the major political parties to the spread of grassroots movements like Black Lives Matter and $15 Now, people across the country and across the political spectrum are reclaiming power. Are you ready for this age of bottom-up citizen power? Do you understand what power truly is, how it flows, who has it, and how you can claim and exercise it? 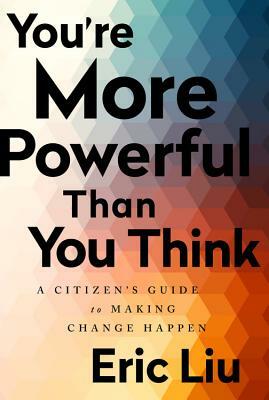 Eric Liu, who has spent a career practicing and teaching civic power, lays out the answers in this incisive, inspiring, and provocative book. Using examples from the left and the right, past and present, he reveals the core laws of power. He shows that all of us can generate power-and then, step by step, he shows us how. The strategies of reform and revolution he lays out will help every reader make sense of our world today. If you want to be more than a spectator in this new era, you need to read this book. Eric Liu is the founder and CEO of Citizen University (citizenuniversity.us) and executive director of the Aspen Institute Citizenship and American Identity Program. He is the author of several books, including A Chinaman's Chance, The Gardens of Democracy and The Accidental Asian. Eric served as a White House speechwriter and policy adviser for President Bill Clinton. He is a regular columnist for CNN.com and a correspondent for TheAtlantic.com.